Published: Feb 10, 2011 to ? In the world of Ente Isla, the Demon Lord Satan has attempted to conquer humanity using an enormous army of demons. But when he almost succeeds, mankind's champion, Hero Emilia, thwarts his plans, forcing him to retreat into a portal that leads to a world unbeknownst to him—Earth. Along with his faithful servant Alsiel, Satan stumbles upon the modern-day city of Tokyo without any knowledge of the world itself. Completely out of their depth, they gain some information from a police officer, but Satan still has one more problem—money. In order to survive with his greatly diminished powers, he guises himself as a human named Sadao Maou, lives in an apartment, and becomes a part-timer at the fast food restaurant MgRonald's. Determined not only to conquer Ente Isla but also Earth, Sadao strives to become a full-time employee in his job, as he believes that it would be a step forward in his conquests. Hataraku Maou-sama! has been published in English as The Devil Is A Part-Timer! by Yen Press under the Yen On imprint since April 21, 2015. In the modern world, Its not easy to live a decent life. You don't get a good life, you earn it yourself . Having job is not an option but a necessity . No matter who you are.. a middle aged man, a young man,a boy, or even the demon king..you need money . And our friend Maou here is no exception either ,as After escaping from a loosing battle in his world , He finds himself in this weird world called "Earth" and now needs to work as employ in a burger joint to conquer the world, Or rather to be able to get a meal for tonight. The story might start of in the midst of a gruesome war between humans and demons, for the land of "Ente Isle".and of course With a lot of blood being shed and people being killed,however the way things progress, might just make you forget that something like this even happened. So, the story itself is not really great .Even though things start good , It has little to offer beyond that . The book doesn't have a grand plot with lot of mysteries and plot twist.In fact, for the most part you yourself would keep wondering, what the book is even about.The plot progression and development are extremely slow, and at some points even non existent . But good thing is that the book realizes that and does not really the story part too seriously. The author knows the true strength of the book and focuses on what is important, that is the characters. Its quite difficult to describe the character line up of devil is a part timer. All of them seem to have a certain charm about them and they fit the overall theme perfectly. Take the protagonist for example, The reader knows that he is demon king who had tried to rule the land of ente isle in the past, However his actions and behavior now, actually makes one wonder about his true motives. He acts, or rather, becomes a good, respectable and law abiding citizen and the only reminder of his true past is the constant complaining of Emi, the hero. The book shatters the image of demons we had in our mind and portrays them as something completely different. The book , as mentioned before, is more of a character driven story and thus the plot progresses very slowly with very little development in each volume. But on the other hand, The author gives a lot of time on developing the characters ,And as we progress further, one notices some major changes in the personality and behavior of some characters, yes i am referring to Emi. However , none of it seems to be forced or rushed, but it rather feels more natural. For instance, Emi's hostile and violent behavior towards the demons changes to a more friendly and caring one, and the way all this happens , actually makes sense and is understandable. There is also good time and effort given to developing relation between the characters . The relation between Emi and Maou was exteremely tense and they hated each other from the bottom of their hearts. However, through various small events, their relationship improved slowly and it has reached a point where the both have some level of mutual attraction towards each other ,and who knows, they might even become a couple. However, equal attention is given to other characters and relations as well, Like the relation between Ashiya and Rika also slowly develops , but its still something far from being romance. But, that is understandable as its not a romance story. Now, its very difficult to describe the art and character design of the book. In one word, i would say its "cute". The illustrations are colorful, attractive and adorable. The character look nothing like what you would expect mythical creatures to be, and that in fact, fits the real theme all too well. They rather seem to be more attractive and adorable, especially Alas=Ramus, who just might be the cutest thing you will ever see in your entire life. In conclusion ..its a good book with one of the most charming cast of characters. It has somewhat of a week plot, but the characters easily make up for that. There also some action, but its very plain and not really the focus of the story. There are moments when things get serious but overall , its really lighthearted .The plot progression is really slow and it might turn off many people who like more fast paced stories. 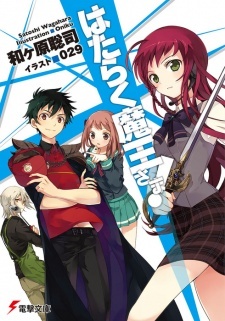 But overall, I really enjoyed the book and it is something i would easily recommend to both newcomers and veterans of Light Novels. [Spoiler] What is the current relationship status of the characters in the latest volumes?